Chocolate cake and lights was all I had to go on for Cody’s third birthday party. I knew I had hit the target when he woke up to find lights strung throughout the living and dining room and his eyes followed the colorful strings of lights to a big chocolate cake in the center of the table. “My friends are coming soon?” he asks. He nods enthusiastically and climbs into a chair to get a closer look. The cover on the cake removed, Cody smiled broadly, “Miles from Tomorrowland! Chocolate cake! Lights! Can I taste it?” He quickly swiped a finger full of icing and the party began. Friends and family, astronauts and far away galaxy explorers arrived with jet packs and bright white suits. Rookie space cadets built their own jet packs. Equipped with ample supplies from the galaxies’ best Grandma who secured enough soda bottles for all, Cody’s blastastic team of explorers were ready for action. Traveling out of earth’s atmosphere and chasing rockets proved exhausting. The space travelers had to refuel at the nearest space station. 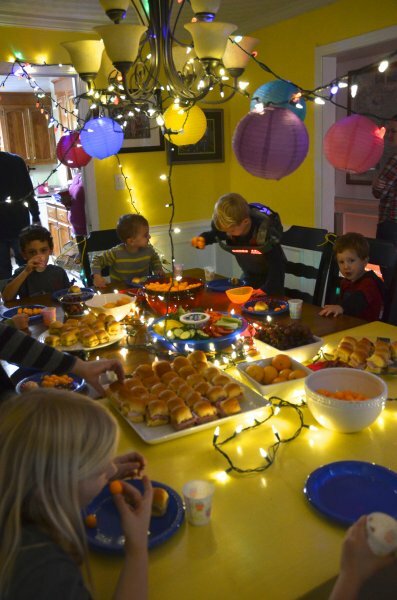 Sandwiches, cheese balls, fruit, and veggies. Lemonade to wash it all down. The quick fueling inspired them to tackle the colorful asteroids that contained birthday treasures. Stuffed puppies, play dough games, bike lights, books, and Miles from Tomorrowland toys galore. Cody was overwhelmed! What better to fix it than chocolate cake! A chorus of song exploded around him. His smile was beaming with delight. Characters pulled from the sticky icing and diligently licked clean. A slice of double chocolate cake, Cody was past space and in Heaven. 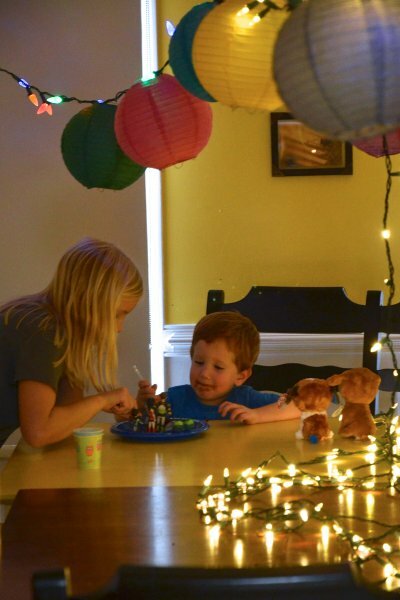 A second slice was soon slowly enjoyed in the quiet of the dining room while his friends tackled a rocket pinata. Leave it to the team, Cody knew where to keep his focus. Life is grand and the wonder of three has just begun. December is the perfect time of year to celebrate. From a Mini Mack party to the joyous Christmas season. The twinkle lights are staying on, twisted around windows in the Mini Mack bedrooms, anticipating the glorious season of Christ’s birth. Another year as Mary in the nativity, I am in awe of God’s grace and love for me and those around me. I had the privilege of taking many family photo shoots for friends’ Christmas cards. Two especially meant so much. I met Sarah through my sister and brother in law. She lived near them in one of their apartment complexes. Her royal British accent captivating us all. Her humor an absolute thrill. I was asked to alter her princess wedding dress a few years ago, so beautiful and exciting! A few years forward, I cried with her when she came for alterations with a too-large bridesmaid dress, her belly no longer growing with another baby who returned to Heaven. But as Sarah and her adorable husband have shown me, joy comes in the morning. Joy comes in the promises of God. He will never leave us nor forsake us. I might not understand why babies don’t make it out of the safety of their mother’s wombs, but I know this, God brings healing and joy in even the toughest situations. Joy, in its miraculous timing, comes. My other favorite shoot this fall was with the Johnson family. 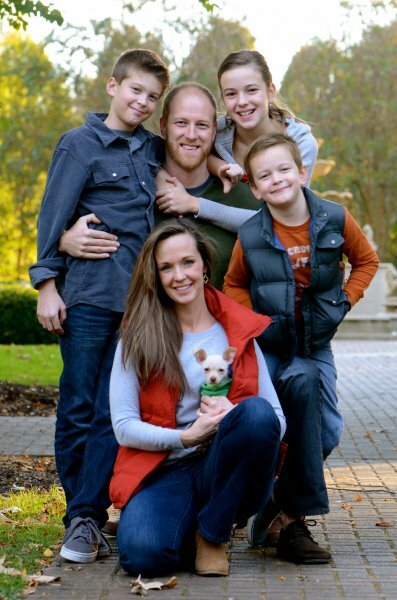 Rachel, who looks like wonder woman (stunning blue eyes and cheek bones) and acts with the same powerful strength had her biggest test of trusting God last February when her husband and our friend, Tim, died. Through a series of miraculous events, skillful and faithful people, and the will of God, Tim came back to life from an otherwise fatal heart attack. It was truly stuff of story books and blockbuster movies. In a word, unbelievable. But believe Rachel did. A steadfast woman, she held on to God’s promises, she clung to Tim’s hospital bed, and trusted in the miraculous wonder of God’s faithful power to restore. The merciful beauty of the Johson’s photo shoot wasn’t lost on me. It was an honor to be there, capturing their family photos with everyone together. Merry Christmas all! May you all have a season of wonder filled with joyful thankfulness! All I can say is they just keep getting better and better. Just can’t believe Cody is 3 yrs. old – unbelievable! He is so precious! Looks like they all had a wonderful time! He finds many things “unbelievable” lately as well (a favorite word of his…so is “fantastic” and “if you say so”). Being three is one of them. Flying by with tons of precarious fun! What a clever mom you are! The whole concept was so imaginative and so Cody! So fun, as always. Those smiles are precious. Love it. Dear Charity, thank you for continuing to share your Mini Mack adventures with us old friends! I LOVED your pictures and account of Cody’s birthday party including the imaginative jet packs that allowed him and his party guests to travel out of earth’s atmosphere and into the stars, the Christmas play, and the touching stories behind the beautiful family photos you did. Wishing you and your family more special adventures and also a blessed and Merry Christmas. Gloria! So great to hear from you! Love you lots!